Spring is a time for new beginnings and no one knows that better than Linda Wong, who is relaunching her Canopy Verde accessories label with a completely cruelty-free collection of totes and clutches. Inspired by the Brooklyn designer’s Prospect Park neighborhood, mid-century Danish design, and her two toddlers, the carryalls feature organic cotton, Oeko Tex-certified dyes, chemical-free embroidery, and polyurethane pleather accents. “My bags are designed to meet the needs of a working professional, busy mom on the go, or a group of girlfriends planning a weekend out of town,” Wong tells Ecouterre. To toast the arrival of warmer temperatures, we’re giving away one of Canopy Verde’s brand-spanking-new Cassia Mini bags in your choice of violet or slate. Feeling lucky? Enter now to win! 2. LIKE CANOPY VERDE ON FACEBOOK. 3. LEAVE A COMMENT and tell us what Earth Day/Earth Month means to you. Although it doesn’t hurt to get fancy, we’ll be picking a winner at random. We’ll announce the winner in our newsletter on Wednesday, May 2. The deadline to enter is 12 midnight ET on Tuesday, May 1, so ENTER NOW for a chance to win! Canopy Verde was founded in Fall 2008 by designer Linda Wong. The line uses organic cotton and bamboo fabrics, cruelty-free polyurethane, Oeko-Tex-certified dyes, and chemical-free embroidery to make stylish, practical bags for women who want to look good without harming the earth. Originally published on April 19, 2012. Earth Day means sharing conservation information and inspiring people about the goodness of our planet earth. We have to preserve the earth for the next generation. Earth day means spreading the word and trying to get other involved in the preservation our planet, but it also means living by example year-round by doing everything we can to model earth-friendly behaviors to others and showing them how easy eco-friendly can be! Earth day is not just once a year! Its doing things every day to protect our environment and planet for ourselves, our children and so on. Earth Day is about lending a hand, loving nature, nurturing our planet, loving life, peace, conservation, & our global duty to sustaining a clean environment for future generations. One of the reasons Earth Day is important is not only does it bring different people together for a community-minded purpose, but it reminds us that Earth Day shouldn't just be designated to one day a year. We should be as mindful of the Earth and both it's and our future, 365 days a year-- not just one. Earth Day reminds us of that fact. Earth day means "busy" if you are an environmental educator. Earth Day should be every day, and for everyone. We all live her you know! You can start with recycling, reducing, and reusing, but there is so much more to do! Earth Day to me? Well, this past month, I have started an eco-friendly business to help consumers find, try and buy eco-friendly, all-natural and organic products. I have accomplished so much throughout this year, but I want more of myself, my community and the world around me. All this year, I have been purchasing eco-friendly products and donating money to 'green' causes. For ending this year, I'm going to talk to the students at high schools in my surrounding school districts. The objective will be to teach them some valuable lessons about Earth friendliness and how products they use can help or damage our Earth, in which they can carry throughout the rest of their lives as a tool. Earth Day is a reminder that "Earth Day is everyday!" I look forward to Earth Day because it's the day I can clean house properly without adding to the landfill. Our county does an extensive job of collecting Paint, tires chemical, electronics, and the more common plastic,glass and tin. This year I'm helping friends too. Earth Day is about acknowledging our planet in it's natural state and taking steps to maintain that beauty. Earth day reminds me that taking care of this planet IS taking care of all the people/animals that inhabit it. Earth day reminds me my roots, who we were before and now. The comparison gives me a real image of our lifestyle. So that day i'll wake up take care of my flowers, i'll not use electrical equipements and i'm sure i'll go to the beach to refresh my thoughts from daily activies... at least i was really sincere. Earth day is an annual reminder that we are part of this planet. It's a reminder to think about how we and our lifestyles fit in the grander scheme of nature and what we need to do to keep the planet going. Earth Day is just a normal day for me. We should consider the Earth and how lucky we are to live here every day of the year. I've celebrated Earth Day since it's inception and make a point of protecting the Earth everyday. This year I'll be helping others recycle their e-waste, picking up from my neighbors (esp. the elderly) and taking it to be properly disposed of. Earth Day for us is every day, but it is a day that we especially remember our impact on the Earth and think of how we are leaving it for future generations. Earth day means lets reflect on our beautiful planet and make sure we keep it that way.. think of ways you can leave less of a blueprint on this world. and then act! As an Up & Coming Eco-Friendly Designer; Earth Day to me means giving back to the world we live in by making a difference. Each of my designs are made only with sustainable, recycled materials and responsibly sourced fabrics. I�m blessed to have a platform to create positive change through my art of Fashion.I�m absolutely committed to the environment outside of my business!I endeavor to create balance in my life by making smart choices about my purchases & my everyday habits.I don�t believe you have to sacrifice anything to be sustainable. It sometimes takes more time to reuse things than dispose of them.Sometimes in our hectic, mass consumer culture; I think it is wise to think about how our decisions impact the world we inhabit.I hope everyone has a HAPPY EARTH DAY! ONLY "YOU" CAN BE THE CHANGE; START TODAY! Earth Day means reminding ourselves that we are part of the earth, and also my mom's birthday! Earth Day is a day to celebrate how fantastic nature is as well as a time to remind people of their environmental responsibility and make new goals of you own. Would love to win this bag! On Earth Day I assist at a gardening workshop. I learn new things at the breakout sessions and then man a table display to teach people about cool ways to garden with kids! Earth Day is a wonderful time to pay attention to all of the things affecting our planet and how little changes can help. Earth Day is a day when the whole world finally honors our planet in a way people should every day. I wish people would think every day is Earth Day, but at least the Earth gets a yearly pampering treatment. Earth Day is about showing our beautiful planet the respect it deserves. Earth day means showing how much you love the environment with all the thing you can do to keep it looking beautiful! It means a lot to me. I want to leave this Earth better than I found it for my son's generation and beyond. Earth day means showing how much the environment means to us by doing all that we to preserve and keep it beautiful! Earth day means an awesome opportunity to share how Eco friendly my Vegan diet is with lots of new people every day! Earth Day is a reminder to not forget the importance of the Earth. Busy lives and excuses are easy, but this is the time of year to put that on the shelf and get back to nature and what is really important. Earth Day is a time that we can reflect on the "green" changes that we want to make in our lives, and encourage our friends and the businesses that we like to do the same. Earth Day means being more aware of your actions and spreading the word and making a difference. And hopefully keeping up with it past Earth Day. Earth day to me, means being able to teach my children how the planet is our friend and it needs our help to stay alive and healthy! Earth day means awareness of taking inntiatives to take care and wisely use our resources available. Helping to educate people about the importance of being environmentally friendly. Plant a tree! Use reusable bags. Recycle. Repurpose. For this Earth Day, I went to an Earth Day Festival and learned about ways to help preserve our Earth and be more "green". Additionally, I participated in breaking the record for the largest group aerial photo in support of Beyond Coal. Looking forward to putting the things I learned to use!! Earth Day means appreciation of all things living around you. It's looking at the skies, planting in the soil, and smiling at all the greenery that surrounds us! Earth Day should be celebrated EVERYDAY. Love our planet. Earth Day reminds us how fragile our planet is and how important it is to do everything we can to preserve it. Earth Day means to me, a day to reflect on what better ways we as a family can reduce our carbon footprint even more. A day to slow down and thank the Earth for putting up with us. It means mama-love, of course! Earth Day is another reminder that we should be responsible stewards every day of the year. Every day is Earth Day! I have spent the vast majority of my life in the mountains of the world. As a climber and explorer I see first hand the value of the wild and all it has to offer. Earth Day represents all of that to me! Earth Day for me has become a day to reflect on what's been accomplished and to focus on what needs to be done for the environmen. Earth Day/Earth Month means to me another opportunity to care about something bigger than yourself for the greater good . Earth Day is a time to breath deeply and Give Thanks for all the beauty that we are here to respect and survive on. Earth Day/Month is an opportunity to continue practicing and improving upon eco-friendly, earth-conscious ways of living and loving life! Earth Day is another opportunity every year to get the word out about the importance of making conscious decisions that effect our planet and it's living things. We can discuss with people we know the effects of chemicals, styrofoam, plastic, and the many products manufactured with oil...which is practically everything we use on a daily basis. Earth Day is everyday!! Earth Day reminds me to reevaluate annually how I impact the Earth. What does it mean to be a good steward to the Earth? How are the foods made? How do I clean-up and dispose? It is so important to recognise our beautiful planet EVERYDAY but it never hurts to hold ONE special day to remind people how important it is to keep it looking and feeling good! Earth Day is a great reminder that we are all in this together, and we need to take care of our home. Earth day is the perfect opportunity to let people know how fun and easy it is to live an eco-friendly lifestyle! When I was little, I had a shirt that said "Celebrate Earth Day Every Day", so to me - Earth Day just reminds me of another day. Another day to live green, with thought and passion for the health of our planet. If it takes a single Day to raise awareness, great. But it's just another day for me! Earth day celebrates the green movement around the world. It is a day to raise awareness on the environmental issue. The goal is to adopt sustainable practices to our lives. Earth Day serves as a reminder of our connection to Earth and the environment and all that we can and should be doing to conserve and improve our planet and its natural resources. For me, Earth Day really is every day. My job involves conserving natural resources. My hobbies predominantly take place outside. When I clean my home, I use Earth-friendly products. And I try to eat as low on the foo chain as possible. Little things can make a big difference. Earth Day/Earth Month means to me the attitude to raise awareness of caring for the planet and the environment on a daily basis! Earth Day is a great way for people to recognize that there has been a great deal of damage done. It is a day where we should make a change that will benefit the Earth, but really, everyday should be Earth Day..
Earth Day reminds me of discovering PETA, Rock Against Fur, and Vegetarian Sushi back in 1989. Good Lord, I am an old neo-hippie. Thinking about everything we do. Cleaning our homes, the clothes we wear, the things we buy. Treading softly, planting something. All these are things we all need to do everyday, not just on earthday. Earth Day is a wonderful opportunity to reflect on why we're vegans and also recommit to our values for a better planet through veganism. Earth Day is always about what WE as humans can do to be AWARE and actively HELPFUL towards invigorating our Mother Earth and not destroying her as that thought which gets lost on all other days of the year. Since I was a child I've always made sure to Plant and HUG a tree every Earth Day!!! Earth Day is Everyday! When we care for the whole earth we care for ourselves. 1. SIGN UP FOR THE ECOUTERRE NEWSLETTER. done [email protected] 2. LIKE CANOPY VERDE ON FACEBOOK. done amy rouse 3. LEAVE A COMMENT and tell us what Earth Day/Earth Month means to you. Saving the planet and her resources so that they'll be there for my fabulous grandson Eli Sachs!!! This time of year reminds me of what we have on this planet and how delicate the balance really is! it is so important to protect what can't protect itself: the flora and fauna, the seen and unseen.... it just isn't a day or month, this is a practice which is life-long and Earth Day serves as a friendly reminder. ty everyone! Earth Day should be celebrated everyday not just once a year! To echo some of the above - Earth day is every day, and ecoconsciousness a lifestyle, not something we remind ourselves of once a year. I have changed my life completely to help keep this beautiful planet for generations to come. Including opening my own upcycled, recycled and vintage accessories, clothing and housewares shop. I teach my music students to re-work old electronic instruments to keep them making music for years to come. I also run a zero-waste shop and home - everything that enters as one thing either ends up in the compost pile or leaves as something else!! Earth day/Earth Month is not something that we should only celebrate once a year. We have to remember every single day that this is the only earth we have and we have to take care of it. We must recycle, keep our water clean, and eat healthy. Earth Day means to come together as a community and give back what the Earth has given us. It also means remembering the other 364 days of the year. Earth day is a great way to remember that we should be mindful of consumption and that we should be conserving resources as much as we can. love and respect for the earth. I "like" Canopy Verde on Facebook & subscribe to you by email! "Earth day" is (and needs to be) everyday; it is simply a way of thinking & doing. I really dislike what I call the "phoney green" hype which is primarily used to sell stuff! We recycle, reuse, repurpose, compost, thrift shop, etc., and have been doiong it for many decades- as did our frugal Depression-Era WWII veteran parents- LONG before hit was "hip" or "cool" or "green"! As an Environmental Engineer and sustainability consultant, as a cancer survivor and the mother of a child who died from cancer, as someone that has watched the changes in the places around me - Earth Day means a day of remembering the earth of our ancestors, and protecting the earth of our children. It is a day to renew promises to both our ancestors and our children - born and unborn - to care for what has been cherished and what will be a source of life in the future. Earth day- respect for the future of our beautiful world. Peaceful. Earth day is a reminder that our existence depends on our beautiful and amazing planet. Therefore, we need to respect it and protect it. Every day should be Earth day! Earth Day to me, is a reminder to take a step back from all our manmade entertainment and possessions and stop once in a while to bury your toes in the sand or jump in a lake, and enjoy our planet! I like to remind everyone I know to be a little more eco friendly this month/all year and be conscious of how their actions impact our environment! Earth day is a reminder that our very own existence depends on our planet. Therefore, we need to love it, respect it, and protect it. Every day should be Earth day! Earth day is a reminder that our very own existence depends on our beautiful and amazing planet. Therefore, we need to care for it. Love it, respect it, protect it. Every day should be Earth day! Earth Day to me means embracing nature and all that it has to give:) Doing my part in keeping it clean by recycling and using eco-friendly products. earth day means my birthday is nearly here and I can celebrate it by adding to my hone landscape! Everyday is earthday to me. I am an artist who up cycles plastic bottles and other debris. Someone once said "Garbage is just a failure of the imagination." There is so much unrecognized beauty in the trash heap! Earth Day means sharing and teaching my daughter about little actions that can make a big difference everyday. Earth Day- it reminds us to spend time in nature, take our kids out to play, explore color changing leaves and slimy worms and ugly bugs. :) The more we go outside, the more we love nature, and the more we all begin being a little more eco-conscious. So to me, Earth Day means loving the Earth, because loving nature is the first step to taking care of our planet. Earth Day is a recognition of taking care of the environment in our everyday living. It's being stewards of green spaes, keeping natural habitat to continue having diversity in species of growing things like plants, trees, insects, animals and other creatures. Treat the land gently along with people is my idea of Earth Day every day of the year. Earth Day = What I try and teach my children every day. It is the only earth we have!! To me, Earth Day is meant for us to recognize that we should be more conscious of the environment. Unfortunately, it only lasts a day and most people tend to fall back into their old habits when it's over. Earth Day always serves as a reminder that it's Spring and time to get outside and enjoy our beautiful planet. This year on Earth Day I went for a long run and just enjoyed sharing the outdoors with others. Earth day meaning has evolved over time for me. As time passes and I become more involved in the "fast" pace of life I fin myself using more items (such as a car) that hold negative contributions to the environment. On Earth day I find it important to take more than a moment of that day and dedicate it to the health of the Earth. Whether it be to use alternative transportation, to not be wasteful and use recyclable items, to be more conscious of the waste products I use, and try to inspire someone to become more Earth conscious. Earth Day, to me, means showing true care for our planet earth. Making the right steps to a consciousness for the planet, treating it the way it should be instead of exploiting it. I think it's a day that should last all year, encouraging people to change the way they think and live and view the world. And I think it's about making the world a better place than it is today so that it is still there for future generations to come. Earth day to me means taking a "formal" day to recognize how fragile the earth is and to remember to do things to ensure that future generations will be able to live here. Earth DAy to me means bringing awareness to our planet and realizing we are caretakers of it and must treat the earth with respect! earthday is the day i can reinforce the message about sustainable living to my children. Earth Week is a great way to raise awareness of the importance to treat the earth with respect and that we will be healthier because of those choices. I will be "GREEN WITH GLAMOUR" when I win this lovely upcycled bag!! Earth Day/Earth Month last all year around our house. We do our best to be GREEN!! What does earth day mean to me? Everything! I delivered my baby on earth day. I will teach her what it means to be gentle and responsible to the environment and earth. Earth Day is a reminder for all that we should do our bits for the good of our planet and Earth Month means that we should use this time to reflect and act upon what we should care for - our planet - so that every generation, including those to come can continue to enjoy our planet. I'm working every day to have a positive foot print, not just a foot print that's less bad! Earth Day means reminding all of us that we are stewards of our home planet, not simply current residents. Earth Day means to me..... it's a day that can bring awareness to those that maybe aren't doing anything or everything they can to help save our resources it brings ideas and tips to everyone that we all should be doing. Earth Day means honouring Gaia and perhaps converting a few more Earth Mamas and Earth Papas! Earth Month means something to me because it brings awareness to what can be done to help the earth and what can be done to conserve. If people aren't already aware of the problems that plague the planet, it is a good chance for education. Then hopefully those newly educated persons will make wiser choices in the future. Earth day is a day to honor our mother (mother earth)! Eathday is day that reminds everyone to do their part to help preserve mother earth by learning how to recycle or "go green". I think earth day means trying to do your part every day to do as little harm to the earth as possible. Earth Day is a day to take time to reflect how you can make a difference. we only get one earth. Personally Earth Day is like any other religious holiday. It's an awareness of the reality that this universe does not exist for us, but rather it allows us to exist. A day I usually take to reflect on what I have cared about doing to protect the environment and not out of laziness and think of how I can improve this in the near future. Earth Day is not about how fragile the earth is or that we need to save it. It's not about preserving the universe because it exists for us, it's about respecting the universe because it allows us to exist. We are not the end of the story. Earth day/month doesn't mean much to me. I think we should be mindful of the Earth all the time, being grateful for what we have and doing our best to recycle and preserve things. Earth Day/Month means taking care of the planet. For you..and for others. Earth Day means keeping the Earth healthy for future generations. Spring is a time for new beginnings and no one knows that better than Linda Wong, who is relaunching her Canopy Verde accessories label with a completely cruelty-free collection of totes and clutches. Inspired by the Brooklyn designer's Prospect Park neighborhood, mid-century Danish design, and her two toddlers, the carryalls feature organic cotton, Oeko Tex-certified dyes, chemical-free embroidery, and polyurethane pleather accents. 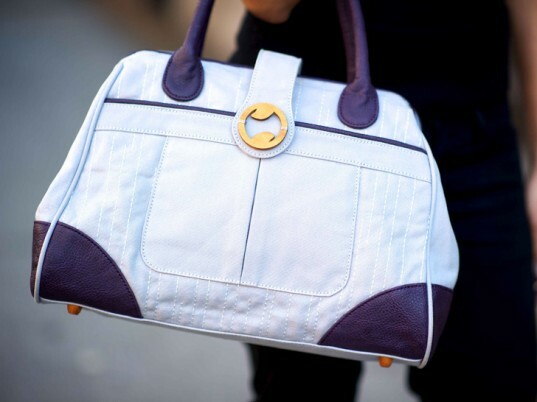 "My bags are designed to meet the needs of a working professional, busy mom on the go, or a group of girlfriends planning a weekend out of town,� Wong tells Ecouterre. 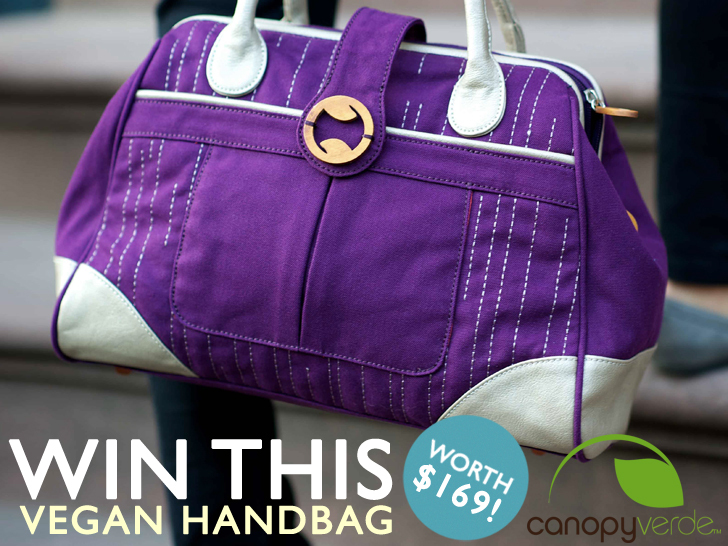 To toast the arrival of warmer temperatures, we're giving away one of Canopy Verde's brand-spanking-new Cassia Mini bags in your choice of violet or slate. Feeling lucky? Enter now to win!